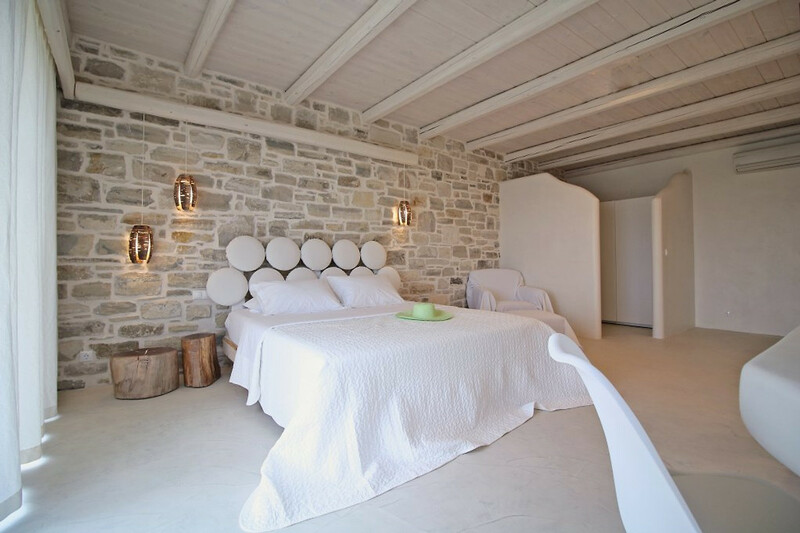 The large and spacious villa, located directly on the beach, offers our guests absolute peace and privacy. It is located only 500m from the sea and has no immediate neighborhood. 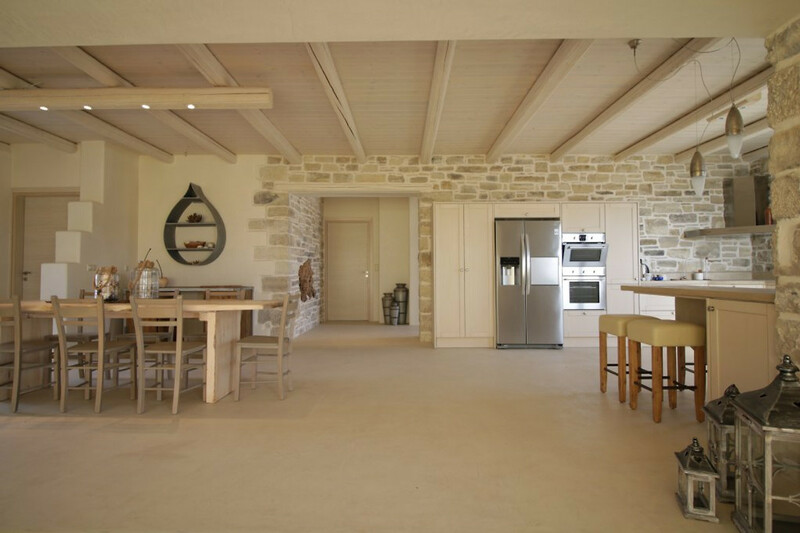 The villa on the beach is a really comfortable house, where you can find the ideal combination of wood and stone. The first thing you admire when you enter this ideal house is the fully open living room and large windows that allow you to enjoy the endless blue of the lake, the beauty of the Cretan skies and the unforgettable sunset all day long. From the house you can admire the tranquility, the beautiful untouched natural landscape and the peace of the soul, which now stand for the high demand of the tourists. Our holiday, eco villa was built in 2016. 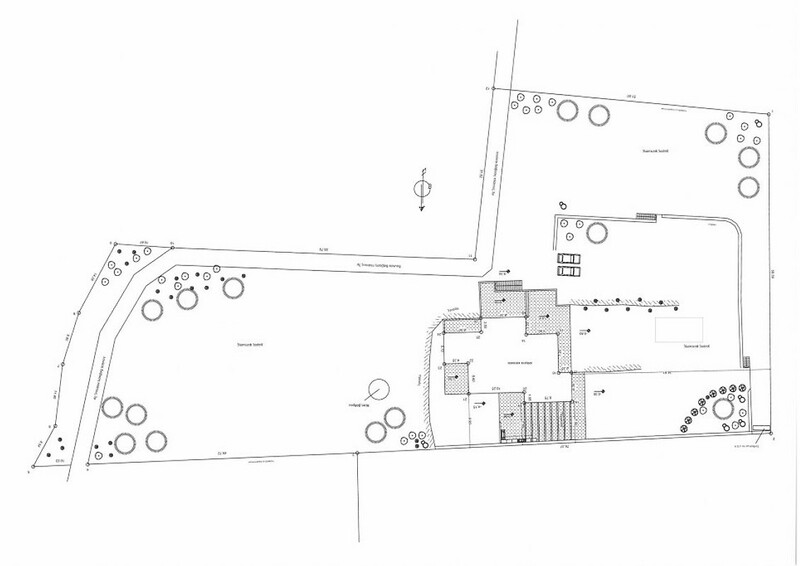 It offers a 300m2 living space and 500m2 garden and is situated on a 7000m2 large building land. 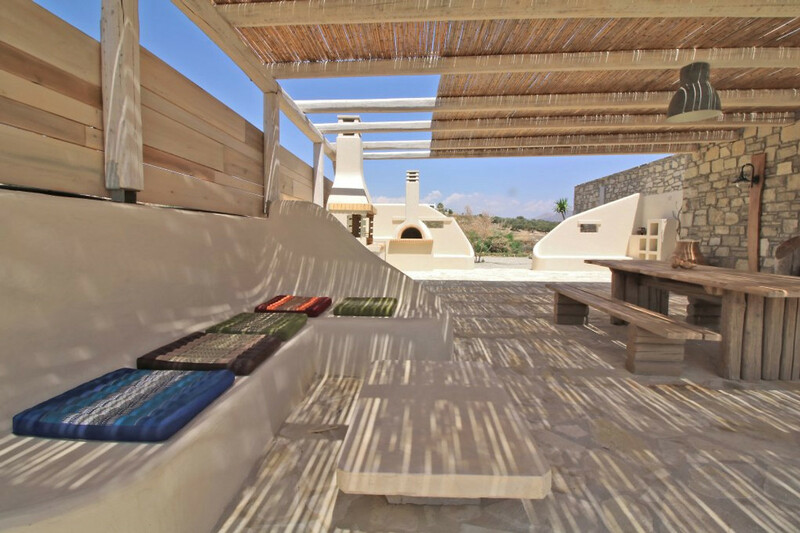 There is also - under a Pergola - a wood-burning stove, barbecue and an outside pool with a fantastic view of the sea. Outside is also an ideal dining area with elegant furniture and a large dining table. The private pool (10x6m) - (1,60m deep) is surrounded by a picturesque lounge area, where there is also a shower and lounges next to the sofa. Special feature of the pool is that it has no chlorine, as it has salt water and is equipped with salt filtration system. 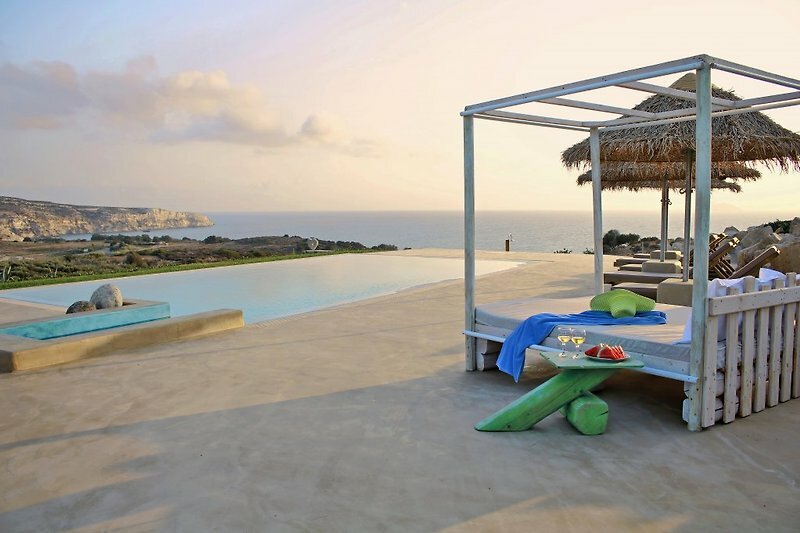 The design and architecture of this villa are specially designed and furnished by the owners. 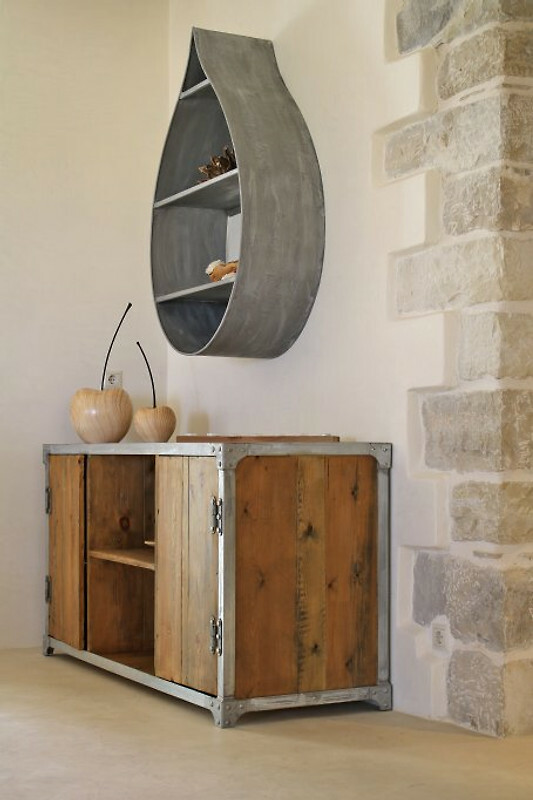 The furniture is handmade and artfully crafted, so that they complete the decoration of this villa. 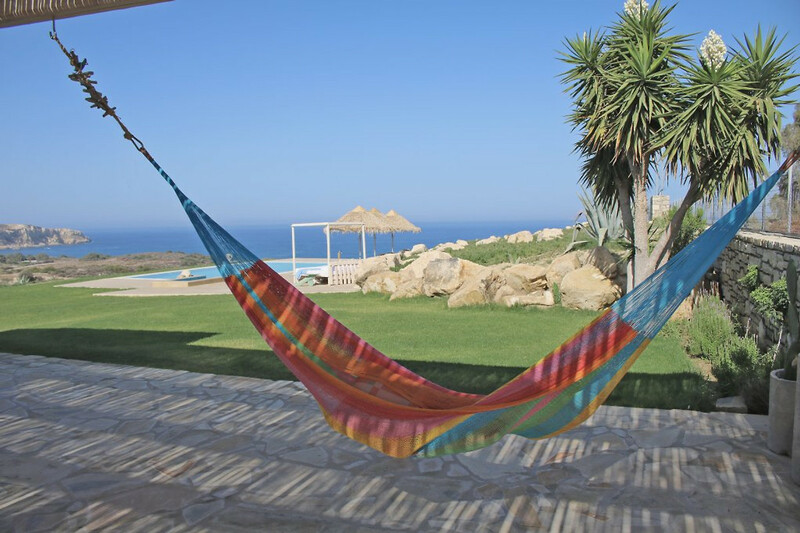 In the house there is a fully equipped kitchen, a cozy living room and a sofa with a wonderful view to the sea. 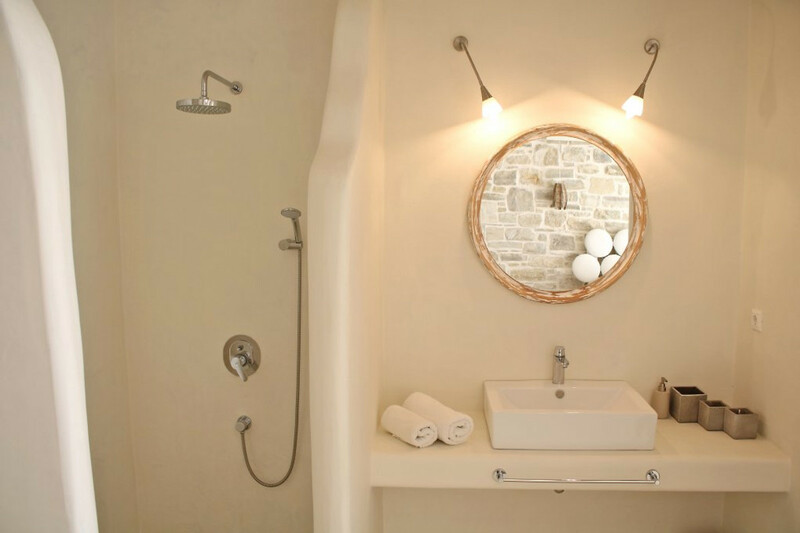 The bedrooms are all fully equipped and have a terrace, a TV and private bathroom. There is a master bedroom with a double bed ( m) and sea view, a double with a double bed () (here it is possible to add one extra bed if you need it) and another double room Two single beds which we can assemble and create a double bed. 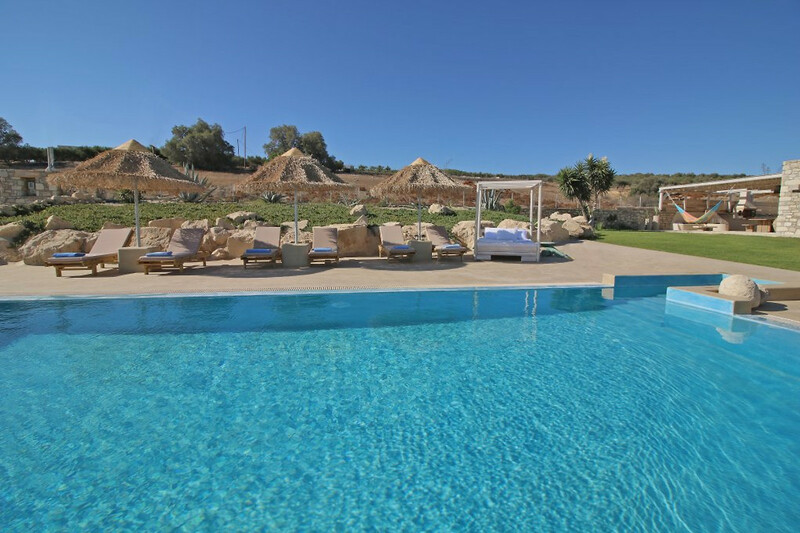 -Relax in the spacious pool while admiring the Libyan Sea. 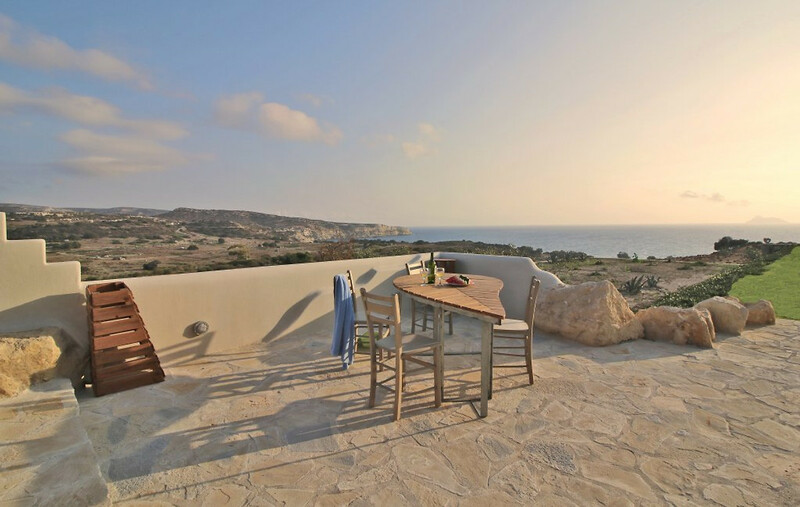 - Enjoy the wonderful view of both the sea and the mountains. Very close by you can admire the view of the beautiful Paximadia Islands. You can have a 360 ° panoramic view of the whole area and enjoy the unforgettable sunset of Villas garden and pool. 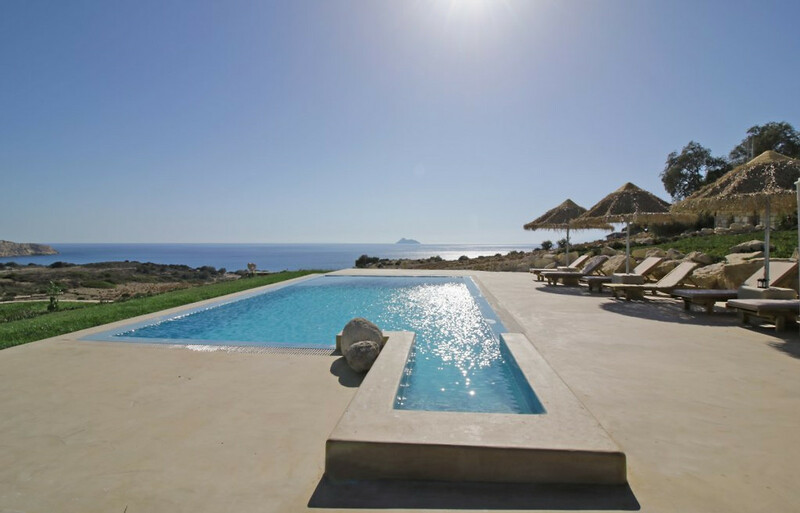 You can also relax by the pool and enjoy the sun while listening to the roar of the sea that is close by. -The finest sandy beaches of Crete are just a few minutes from the house. 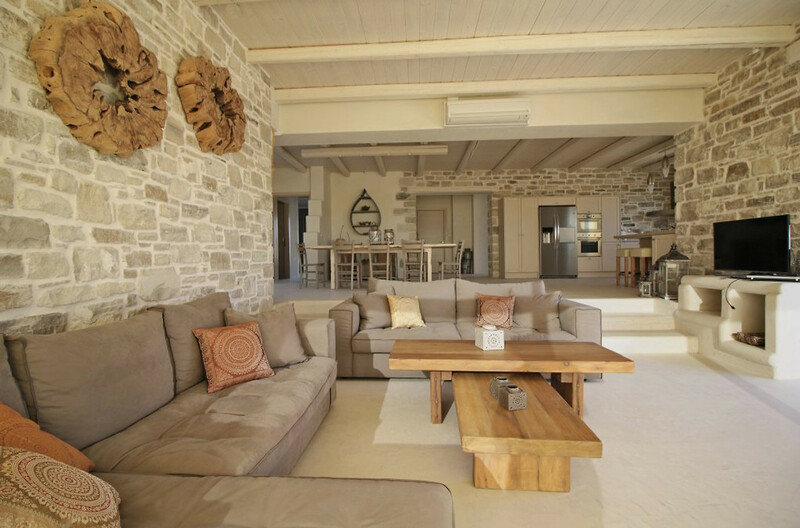 -The comfortable design of the villa and the large windows allow our guests to enjoy the natural light and feel at Komos is located 500m from the Lybian Sea, between Pitsidia and Kalamaki. You can reach the Kommos beach either by foot, by bike or by car since it is km away. If you like to hike, you can easily discover some of the most beautiful beaches of Crete, such as Red Beach (KokkiniAmmos) andAgiofaraggo. You can also easily reach Kalamaki and Matalastrands. Traditional food can be tasted and enjoyed in restaurants or pubs (tavernas) in the villages of Kalamaki, Sivas, Kamilari, Pitsidia and Matala. In terms of leisure, you can go riding in Pitsidia, go from Matala cycling or jeep safari, go from KommosSeakayaking or fly from Kalamaki paragliding. It is recommended to visit the archaeological sites of Festos, Agia Triada and Gortyna. Check in: , Check out: 11: 00. Check-in and check-out can be modified in exceptional circumstances. Please do not hesitate to ask us what you need. The prices can be arranged according to the persons arranged. 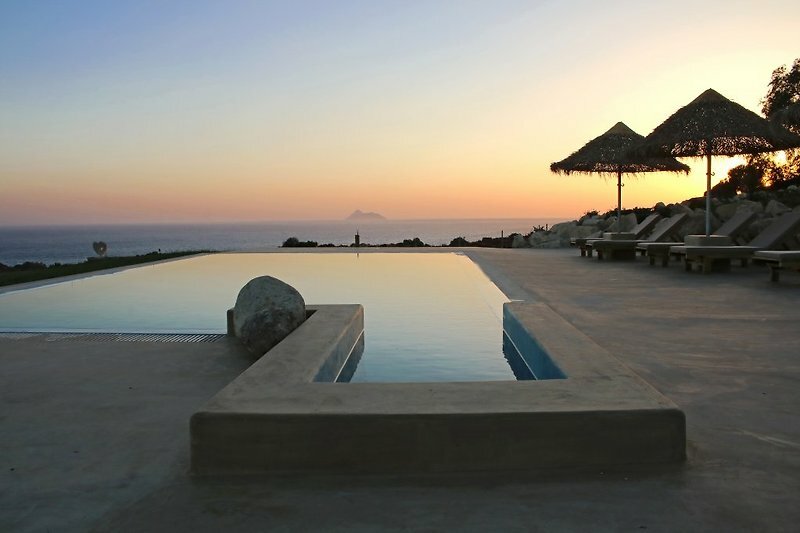 Villa Komos is located 500m from the Lycian Sea, between Pitsidia and Kalamaki. You can reach Kommos beach either on foot, by bike or by car, because it is km away. If you enjoy hiking, you can easily explore some of Crete's most beautiful beaches, such as Red Beach (Kokkini Amos) and Aggiofaraggo. You can also easily reach Kalamaki and Matala beaches. Traditional food can be tasted and enjoyed in restaurants or tavernas in the villages of Kalamaki, Sivas, Kamilari, Pitsidia and Matala. 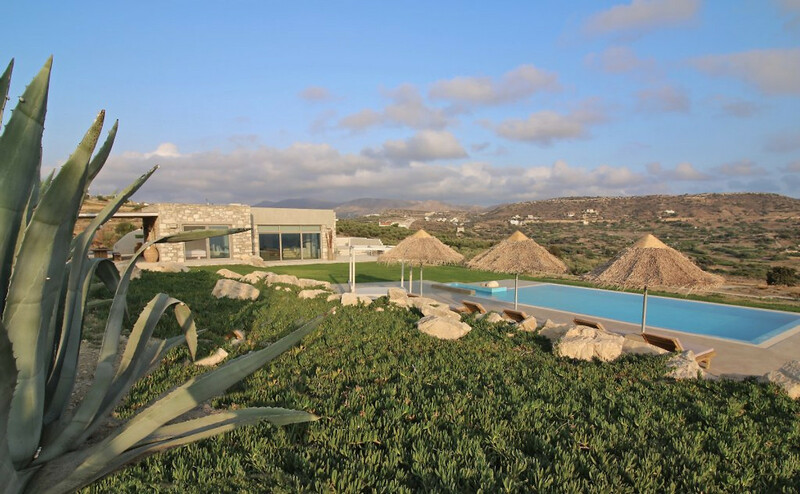 For recreational activities, you can go horseback riding in Pitsidia, ride a Matala bike or jeep safari, do KommosSeakayaking or fly paragliding with Kalamaki. It is recommended to visit the archaeological sites of Festos, Agia Triada and Gortyna. 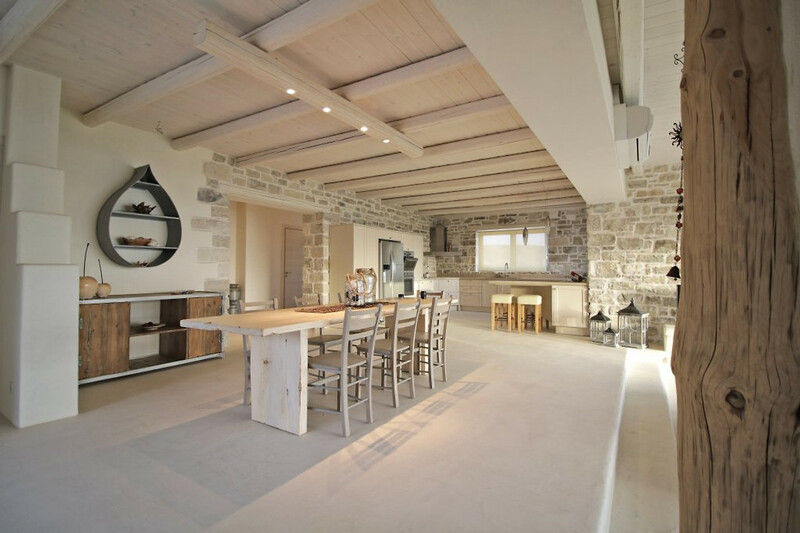 We are a small construction and real estate company in the south of Crete, and also rent houses with full service to our guests. Owner Emmanouil Mattheakis has many years of experience in real estate planning, construction, renovation and sales. 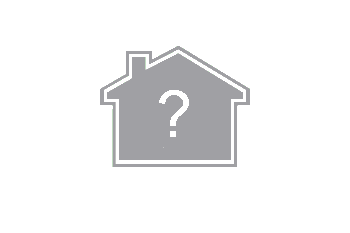 Based on this experience, we always do our best to make things easier for you by following all the necessary procedures for acquiring or renting real estate - all in one, guaranteed! We are looking forward to taking care of our visitors ... and even more joy when they are happy to take when they spent in our villa a nice holiday. We live and work in Messara, one of the most beautiful parts of southern Crete. 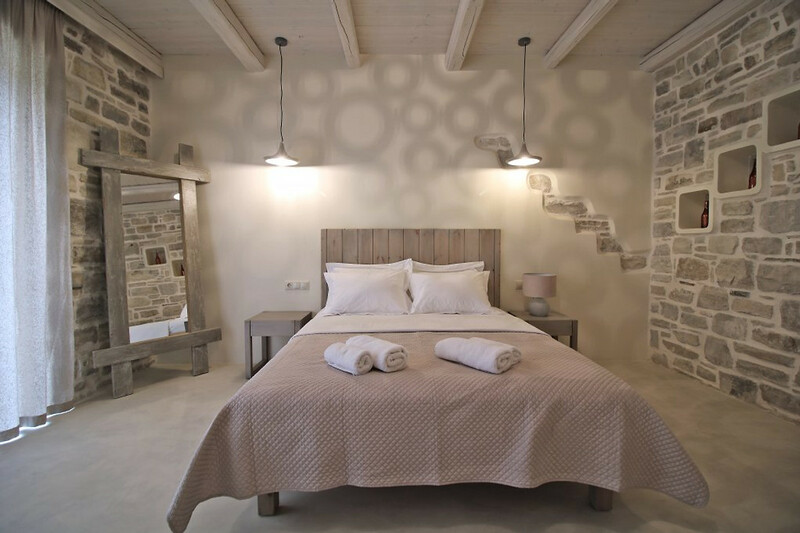 Messara is ideal for those looking for a quiet and cozy place where the climate mild, the summer long, the surroundings beautiful, the beaches and the neighbors friendly. 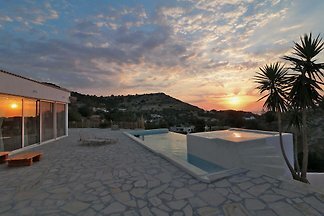 ho trovato la casa semplicemente splendida, tutti i dettagli curatissimi, belle le camere e la piscina. sono stata in vacanza con degli amici e tutti ci siamo divertiti moltissimo, grazie anche alla bellezza della casa, del grande salone e del giardino, curato davvero in ogni dettaglio, tornerei anche subito!!! theodora e suo marito sono due persone semplicemente gentilissime che ci hanno accolto benissimo. Ein wunderbarer Aufenthalt. Das Haus gross, sauber und entschieden luxuriös. Pool und Garten gross genug. Mit allem was man braucht. Das Meer nah, klar und im Westen (Sonnenuntergang) Die Gastgeber waren sehr hilfsbereit, freundlich und dezent. Ein traumhafter Urlaub geht zu Ende. Mit etwas Bedenken sind wir ins Feriendomizil gefahren da wir uns nicht vorstellen konnten das es so schön wie auf den Bildern sein kann. Zu unserer Überraschung musten wir feststellen das es noch viel viel schöner als auf den Bildern war. So viel Luxus, so viel schöne Details, so durchdacht. Es gehen einem einfach die Superlative aus. Theodora hat dort sehr geschmackvoll ein Traumdomizil geschaffen. 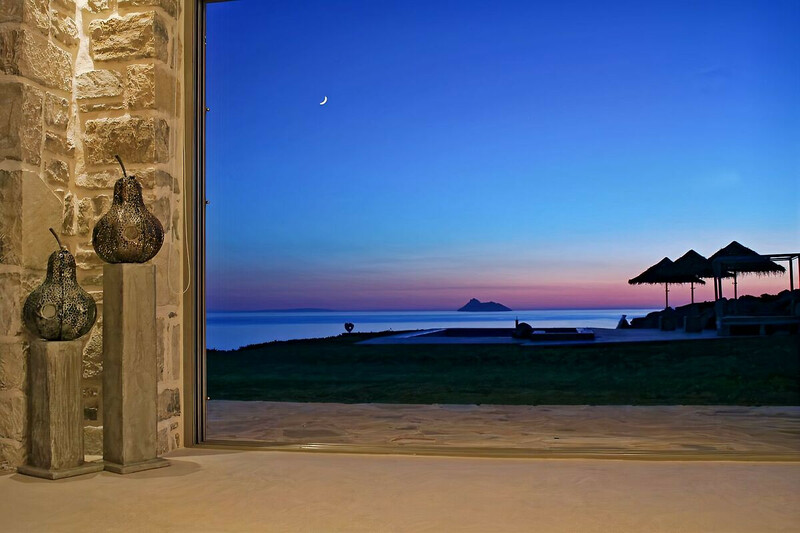 Die Finca steht alleine und man hat einen traumhaften Blick auf das Meer. Es ist sehr sehr ruhig. Auch die Umgebung bietet viele Möglichkeiten essen zu gehen. Selbst in einer Woche konnten wir nicht alles testen. Die Einkaufsmöglichkeiten sind begrenzt. Vielen Dank an Theodora und Ihrem Partner. Es war einfach ein Traum. Wir kommen wieder. Dear Robert, Thank you so much for your kind comments. It was a pleasure to us too, to have you our guests . 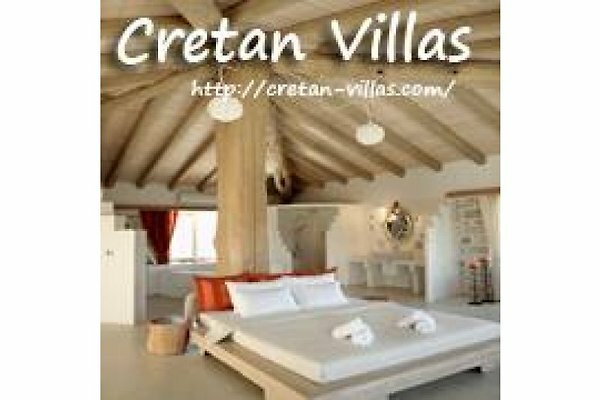 We are delighted to know that you enjoyed your stay and you liked our villa. We hope you visit us again!